The link between influenza, and deaths from apparently-unrelated causes, has apparently been noted for well over 100 years. It’s still somewhat controversial today. Effect on the Mortality from other Diseases. One of the chief characteristics of an influenza epidemic is the effect it produces on the mortality from other diseases. The disorders most conspicuously affected are, as is well known, those of the respiratory system; but others are influenced in an almost equally marked degree. 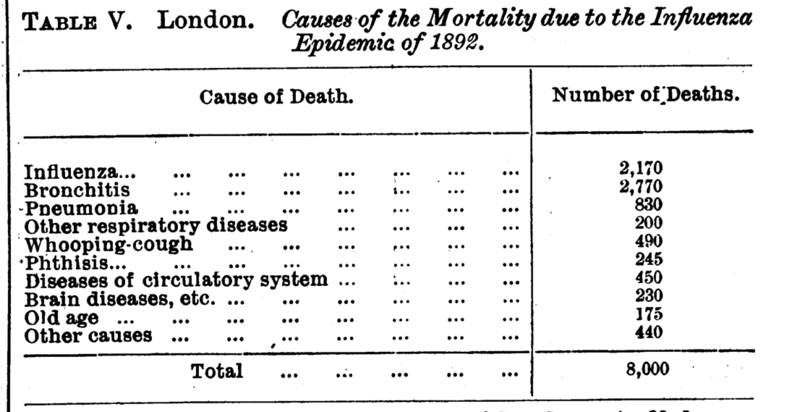 The annexed table gives details of the relation between the mortality due to various causes of death and that attributed primarily to influenza during the course of the 1892 epidemic. Another diagram (No. 1) exhibits the dependence of the mortality ascribed to the two main respiratory diseases, bronchitis and pneumonia, on the presence of influenza for the whole period from October, 1889, to July, 1892. It will be seen that in every instance of the prevalence of the latter, the curves representing the mortality from, the two former rise far above the average; The peculiar significance of these curves lies in the fact that the presence of influenza as the primary cause of death was not recognised in any of the cases which they represent; otherwise they would have appeared in the Registrar-General’s returns under the head of “influenza,” and not under that of “bronchitis ” or “pneumonia ” as the case may be. 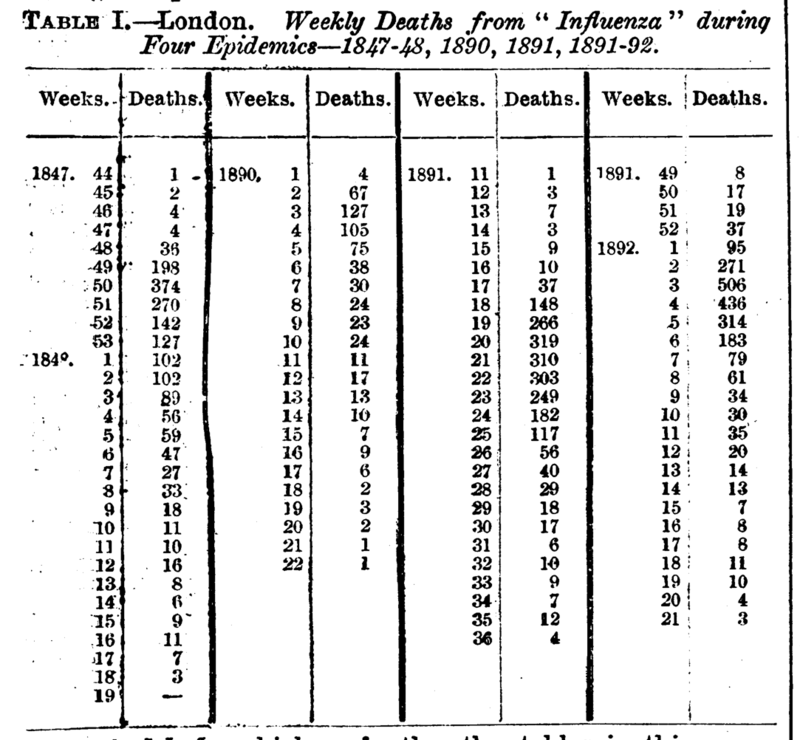 An increased mortality from all or most of the causes that have been mentioned characterises all influenza epidemics, and not that of 1892 alone. It is impossible to believe that the invariable coincidence between the rise of these various causes of death and influenza is accidental, and the conclusion seems inevitable that influenza itself is the determining cause, though it does not so appear in the returns furnished to the Registrar-General. This being the case, in estimating the mortality of any particular epidemic it is necessary to allow for the deaths returned under other heads than that of influenza. Thanks for posting this information. Not everyone knows how bad this influenza virus is. It’s good to have this information posted to educate and aware everyone what this virus is all about and how seriously dangerous this virus is. This post surely is a big help.